The embroiderer Mary Corbet showed us and described a small fragment of the ancient church embroidery that she had been given. "There are some types of embroidery that attract me, for example, the proverbial moth-to-flame scenario is a type of a church embroidery of the 19th century. This fragment of embroidery dates from the second half of the 19th century. 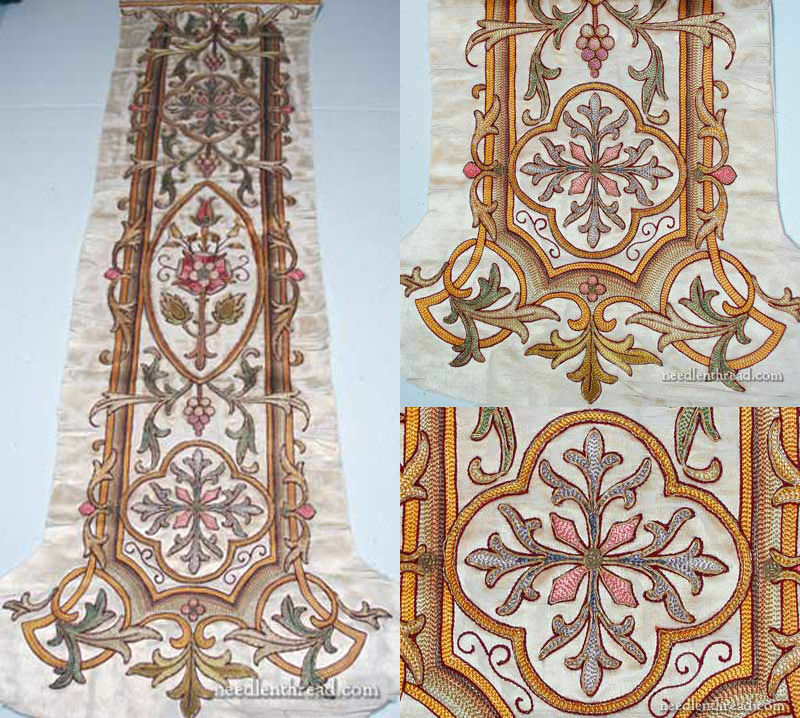 The embroidery was made on silk, the fragment cut from the front of a chasuble (a clerical robe). I received it as a gift. The main fabric is silk, the embroidery is made through both layers of fabric. The silk fabric already falls apart in many places, the threads wear out and fall apart. 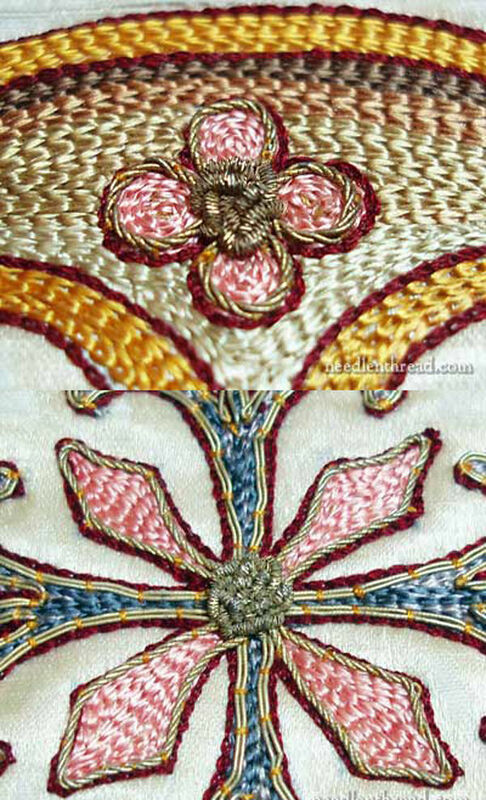 All the silk embroidery is made with the same stitch: chain stitch. It is, in fact, tambour embroidery. Although it is impossible at this time to see individual stitches, but it is definitely possible to see the "texture" of the stitch. Tambour embroidery is a type of embroidery that is done with a tiny hook, similar to that used for the manufacture of carpets, only tiny one. In our days chain stitch embroidery can often be seen in high fashion, a chain stitch is used to attach sequins and beads. Most often this embroidery is made with a Luneville hook (from the name of the city of Luneville in France), and the technique of such embroidery is called Luneville. But the basic chain stitch is actually just a stitch in the shape of a chain, and this technique was widely used in the middle of the 20th century in church embroidery. 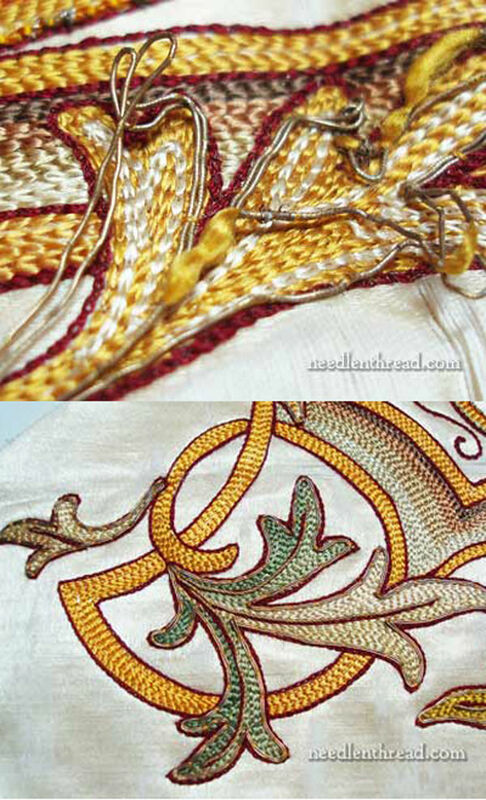 Why is tambour embroidery with a hook made faster than embroidery with a normal stitch? 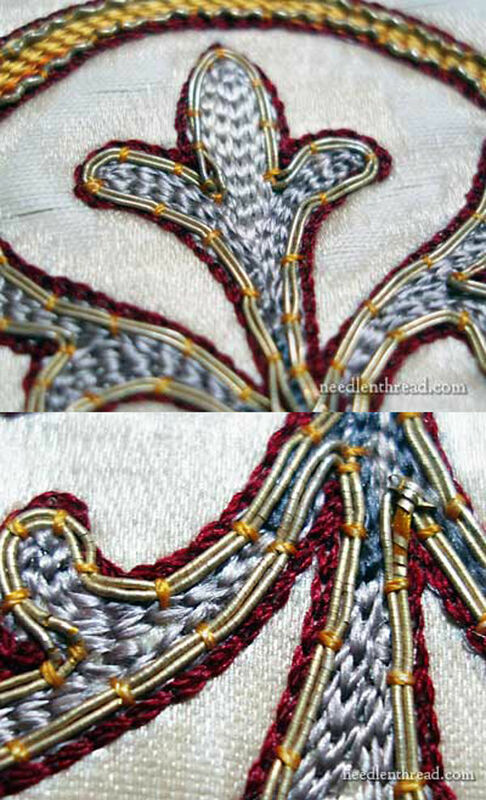 Embroidering with a tambour rows, it is much faster to fill the space. Embroidering with chain stitch using a hook, artisans can make shading and highlight some details, and they do that at a speed that cannot be achieved with a normal needle. When you look at the embroidery closely you begin to understand that the metal threads adorn the entire fragment, they are part of the contours on each element and are used as accents here and there. But they are largely oxidized, and therefore they don't give shine of gold. In fact, they are practically invisible at a distance. But as soon as we understand that they are located throughout the embroidery we begin to imagine what splendor golden glitter would add to the embroidery! You can see the wraps of the passing thread. In the top part there is an area where the winding is divided, and the silk core shines through. You can also see that a chain stitch was used to fill the background, the contour to which was made with a chain stitch of maroon silk thread. This maroon silk has a certain twist, and the main filling is slightly rotated so that it looks flat. The embroidery has the soft, beautiful, luxurious sheen that confirms and justifies my love for silk thread. The rows of brownish and neutral colors of thread create shading effect around the main outline of the shape, they create a shaded frame. This creates the effect that the central part of the structure is located above the frame. If you look closely at these lines of a chain stitch, you will see that each row alternates its direction. Thus, we can assume that the embroiderer (or embroiderers) worked in one direction, then in another on each part of the fragment. Here is another example of golden thread. This little flower is edged with twisted golden thread, and in the center of the metal thread some kind of rounded knot is skillfully laid out. Here's another such knot, also made of metal thread. It is not as bright. The twisted golden threads outline the contours of the rose petals. The grapes are edged with Rococo golden thread. This is a rippled, wavy golden thread, which is fixed. Around the contour you can see the golden yellow color — it is the silk core metal thread, where there is not enough coils of metal. In this photo you can closer see the core of the silk thread, it twists and frays, when the golden coil tears! I thought that the main thread was much prettier! There are, of course, some areas of more serious damages in some places on the embroidered piece. But overall, given the age of the piece and the fact that it was obviously worn during the liturgy (there are certain areas of distressing on the fabric that correspond to the constant use of vestments), it is in a pretty good shape. At a distance the silk embroidery is still sharp and clear, and although the metal threads are oxidized, in most places they are safe, and they really do not distract from the work, even if they don't add to it much in their current state. A little later I would like to show you the central design element in the form of a rose in this piece. 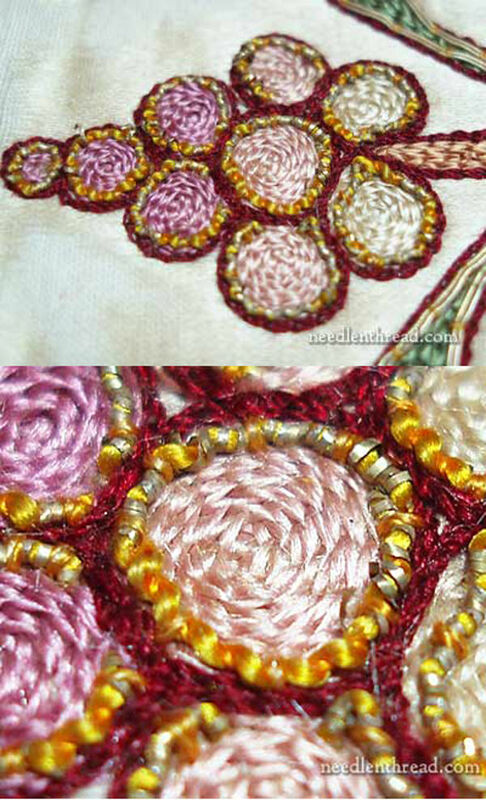 It is in the part of the embroidery that received the greatest damage, but it's still a beautiful work! So, in the continuation we will return to the embroidery and will be able to discuss some points of its execution. I hope you enjoyed this small fragment, preserved from the 19th century! Thank you for watching! I hope you enjoyed my story! By the nature of my activity I often visit the stores that sell vintage and antique things, things that have been in use, but also very suitable for re-use. Let's consider the haute couture collection fall/winter 2018 by Armani Prive.The main part of the looks is very moderate — black and champagne. The philosophy of Hygge has gained much popularity this year. It captured people by the end of 2016 and started to bloom recently. Can't sew, can't knit? No problem: buy ready-made pieces of knitting such as napkins, tablecloths and go ahead! Californian artist Brooks Shane Salzwedel, whose works fascinate and testify to his outstanding talent, creates incredible works in the mixed media technique. This article is devoted entirely to one English cottage hidden among green gardens of the village of Cadbury in Birmingham.